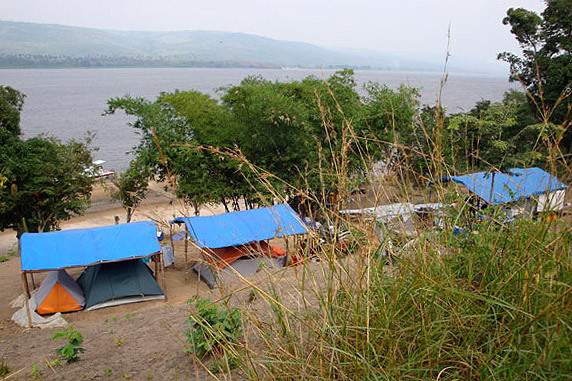 Fishing Maipili is a true wilderness adventure near the surrounding bush and living in large tent’s that accommodate 2 persons each, equipped with mattresses, pillows and sheet’s with blanket’s for comfort. Toilet and shower water is supplied by the rain. 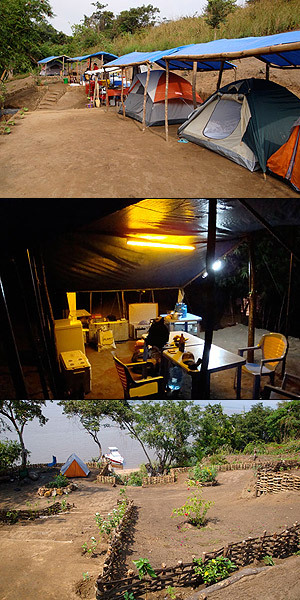 After fifteen minutes climbing up a near bye hill, you have the opportunity to phone anywhere in the world with a mobile phone and The Tigerfish Camp’s team have the ability to call the main lodge in emergency allowing quick return in case of illness, etc. All boats are equipped with life jackets and first aid equipment. 4:30am : The camp wakes up with the light. 5:00am : Daily breakfasts are prepared. 12:00pm : Lunch is served. 390 euro/angler. 780 euro/day in total. 380 euro/angler. 1140 euro/day in total. 370 euro/angler. 1480 euro/day in total. 360 euro/angler.1800 euro/day in total. 355 euro/angler. 2130 euro/day in total. 350 euro/angler. 2450 euro/day in total. Mai Pili lodges consists of 8 double rooms with air conditioning, toilets and showers. 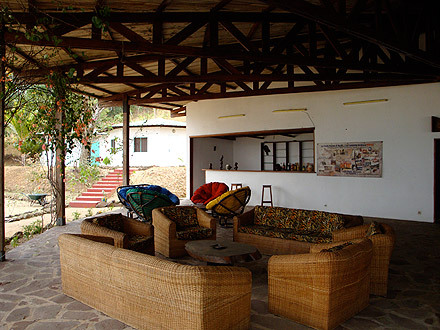 The lodges are situated 120 km from Brazzaville next to the river, surrounded by the bush and its wild plants, and the variety and colours of flowers will delight you. A generator is provided to power lights and fridges/freezers that will keep food in right states of conservation and which contain cold drinks. We light a camp fire at night for the security person who ensures the safety of the camp. 4:30am : Camp wakes up with the liight. 5:00am : Breakfasts are prepared. 440 euro/angler. 880 euro/day in total. 430 euro/angler. 1290 euro/day in total. 425 euro/angler. 1700 euro/day in total. 420 euro/angler. 2100 euro/day in total. 415 euro/angler. 2490 euro/day in total. 410 euro/angler. 2870 euro/day in total. We greet all our anglers at the airport in Maya Maya in Brazzaville and Teddy who works for us, will help you with formalities, the admission on Congolese territory and help you with the release of your luggage. A Manager from Tigerfish Camp’s staff will take you to the boat if you arrive during the day and if you arrive late afternoon, he will take you to a hotel and the next day he will take you to the boat that take you to Tiger fish’s Camp. On your return you will encounter Teddy at the airport for your formality and you must provide the airport’s tax of 20 euro per angler when leaving.